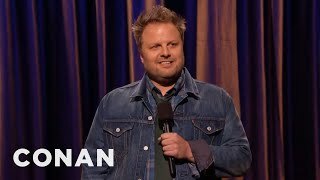 Forrest Shaw made his television debut on Conan in 2014, and appeared on Gotham Comedy Live in early 2015. He has performed in numerous festivals such as, Comedy Central's South Beach Comedy Festival, Boston Comedy Festival, the Big Sky Comedy Festival and was awarded 2013's Ultimate Miami Comedian. Forrest is featured in season two of the FX show Legit and has also appeared on Animal Planet. Forrest is co-writer (and lead actor) of the award winning web series Labor Days & is co-creator of the weekly What's What Podcast. He can also be heard on Sirius/XM Satellite radio. His debut album Mister Grizzly was released on November 18, 2014 on Comedy Records.